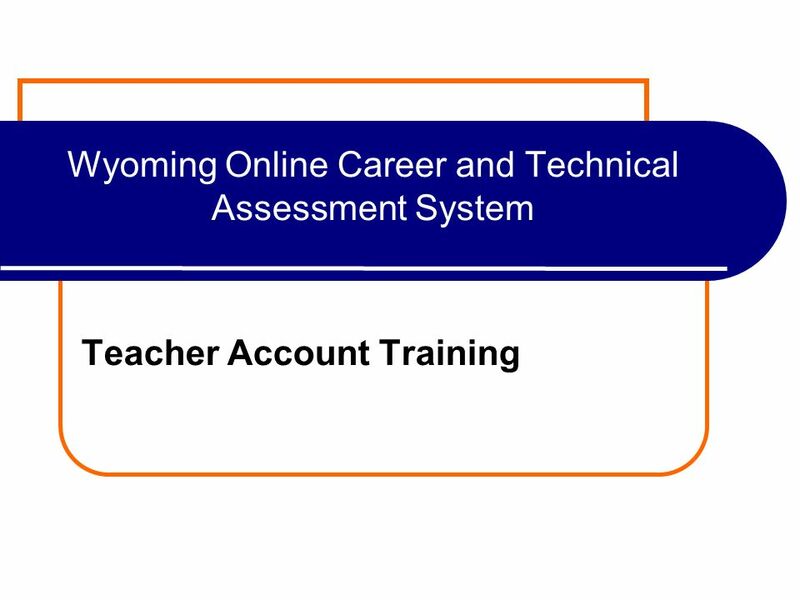 Wyoming Online Career and Technical Assessment System Teacher Account Training. 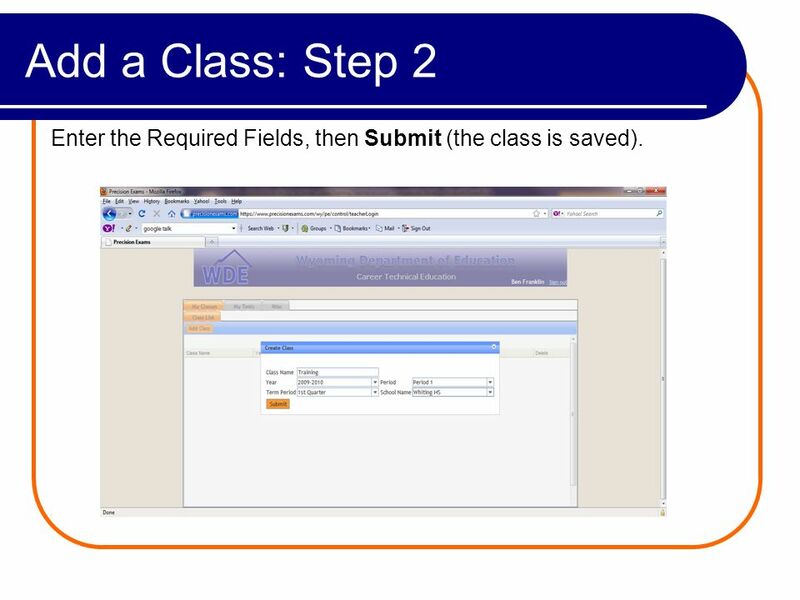 6 Add a Class: Step 2 Enter the Required Fields, then Submit (the class is saved). 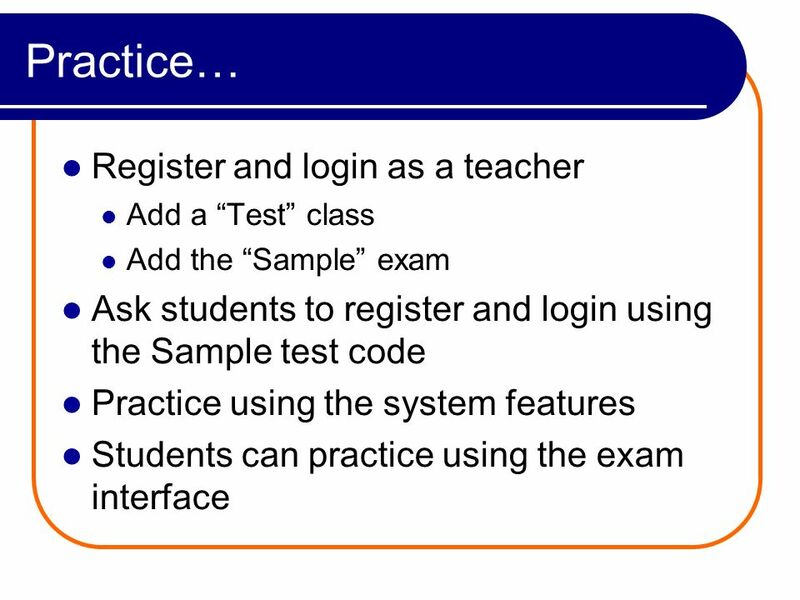 9 Add a Test: Step 2 From the My Tests tab: Provide students with the Test Code. 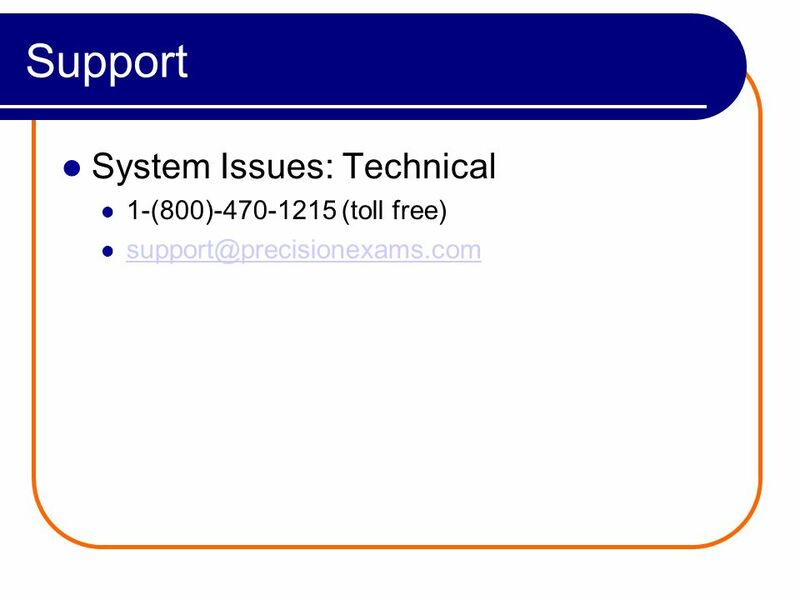 Select Proctor, to view registered students and proctor an exam. 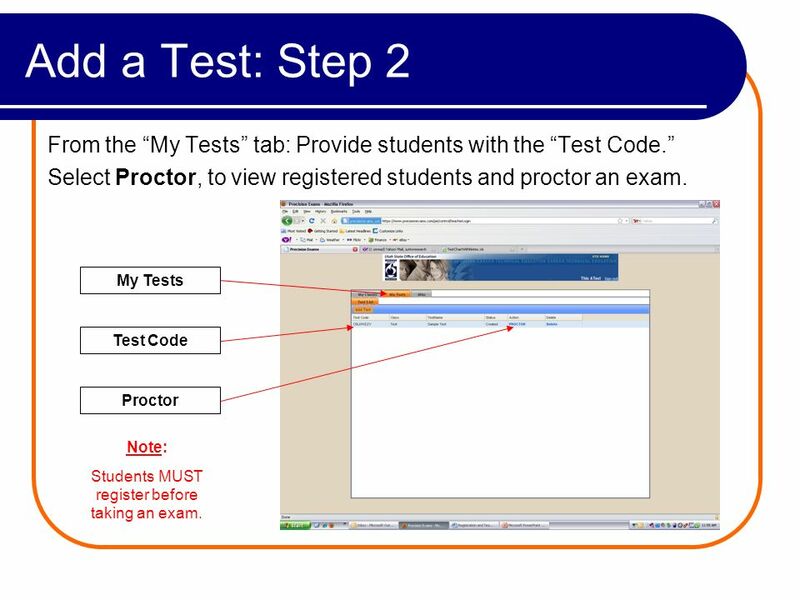 My Tests Test Code Proctor Note: Students MUST register before taking an exam. 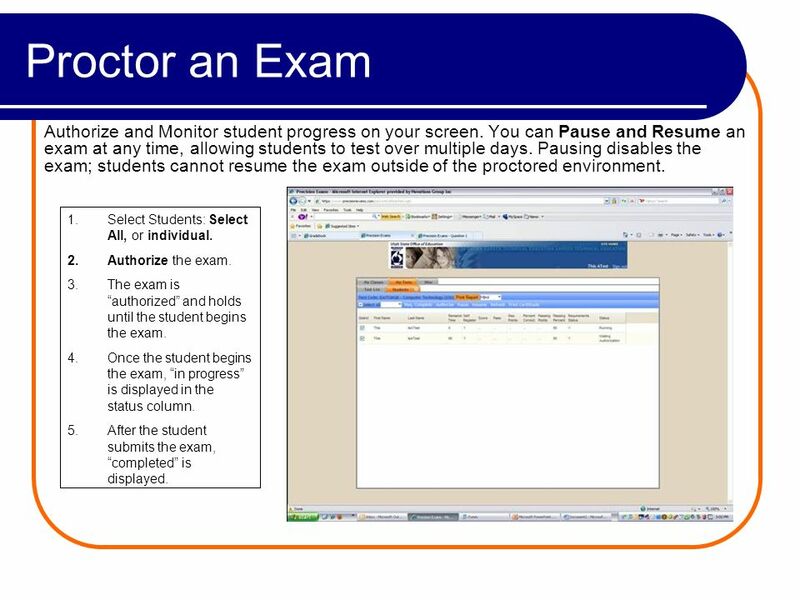 10 Proctor an Exam Authorize and Monitor student progress on your screen. You can Pause and Resume an exam at any time, allowing students to test over multiple days. Pausing disables the exam; students cannot resume the exam outside of the proctored environment. 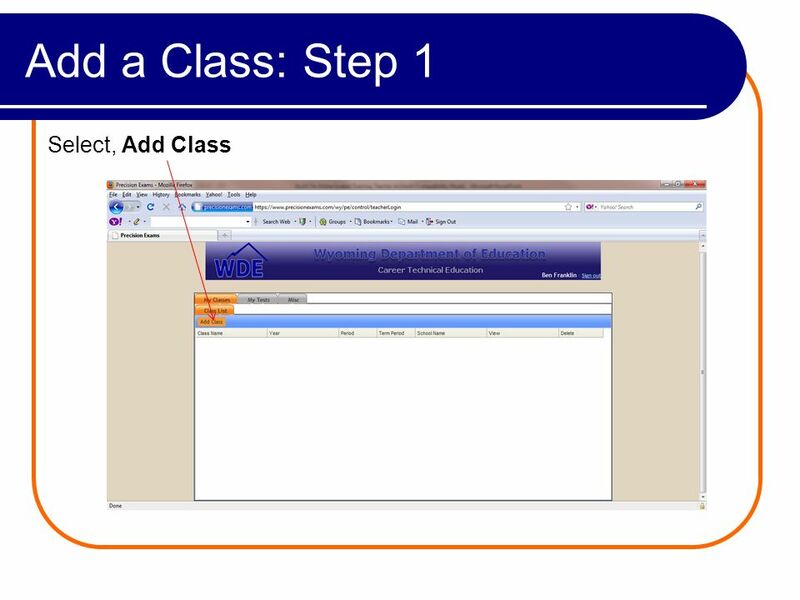 1.Select Students: Select All, or individual. 2.Authorize the exam. 3.The exam is authorized and holds until the student begins the exam. 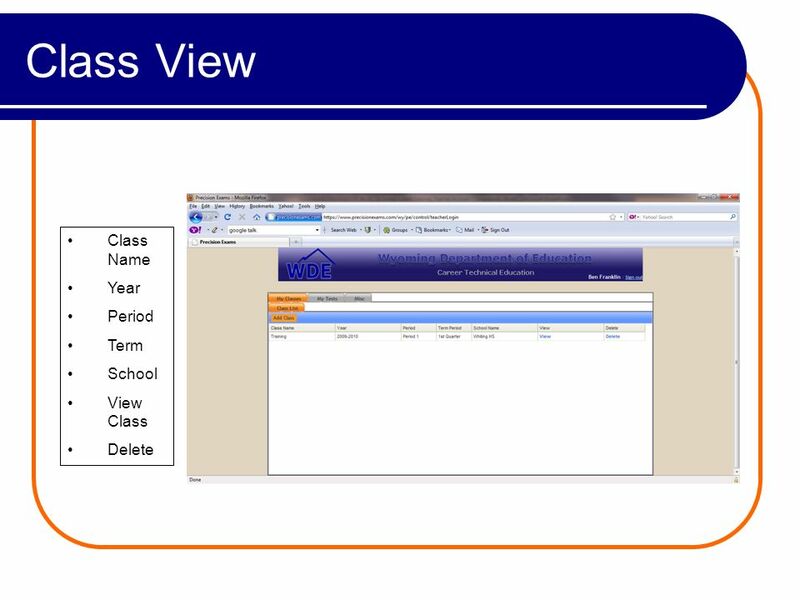 4.Once the student begins the exam, in progress is displayed in the status column. 5.After the student submits the exam, completed is displayed. 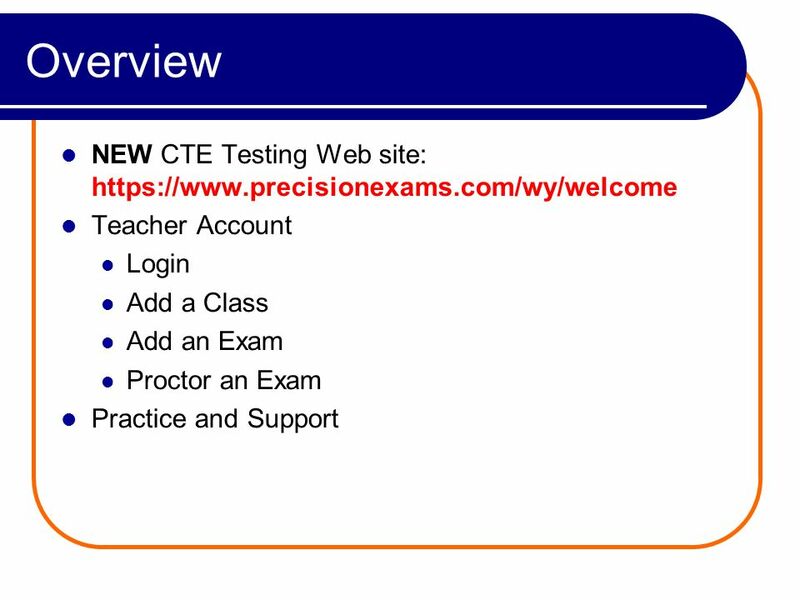 Download ppt "Wyoming Online Career and Technical Assessment System Teacher Account Training." 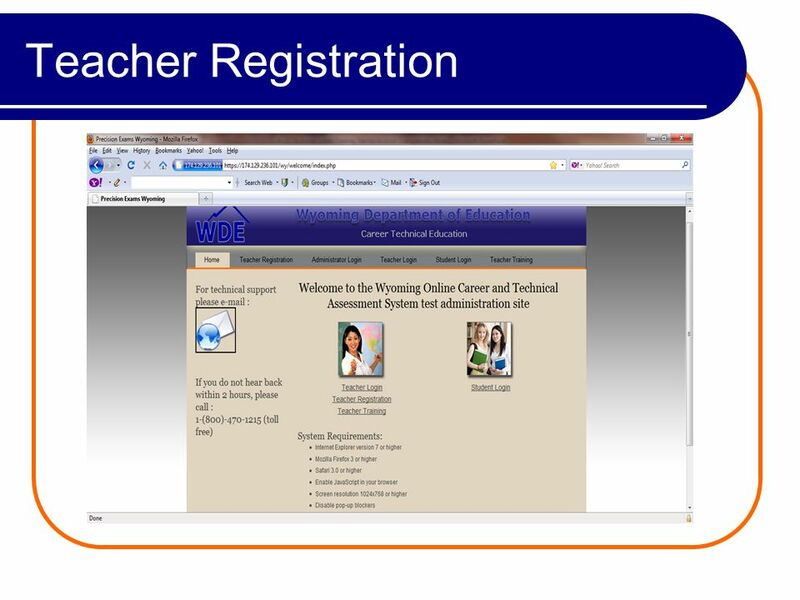 Wyoming Online Career and Technical Assessment System Teacher Registration Training. Division of Alcoholic Beverages and Tobacco In-State Manufacturers Monthly Report. Using NIMAC 2.0: The State Coordinator Portal NIMAC 2.0 for AMPs. NIMAC 2.0 Basics for AUs: Searching, Downloading, and Assigning Files 1www.nimac.us. 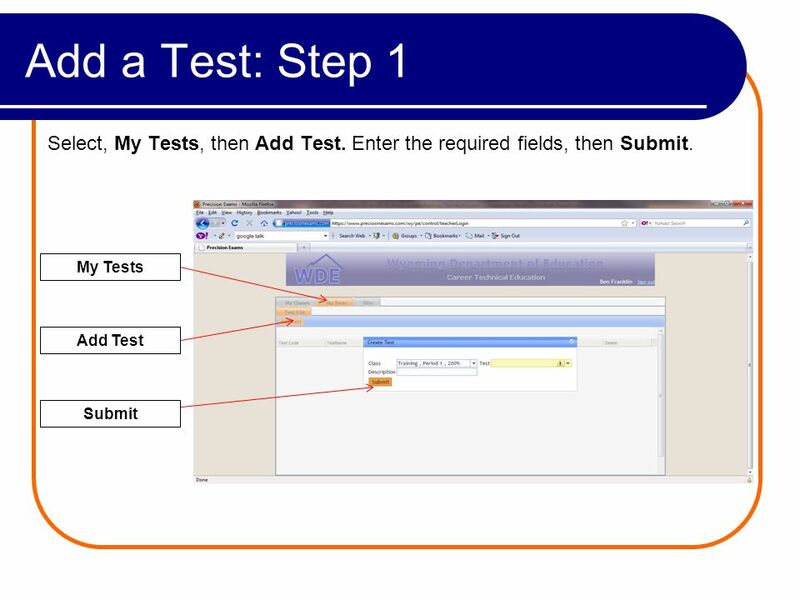 Quick Start Guide | Skill Assessments Using your Online Product Interfaces and Features Getting Started - My Account Creating/Logging into your Self Test. INFRASTRUCTURE READINESS TRAINING. PearsonAccess Training Center  All administrative actions required for the Infrastructure Trial will be carried out. 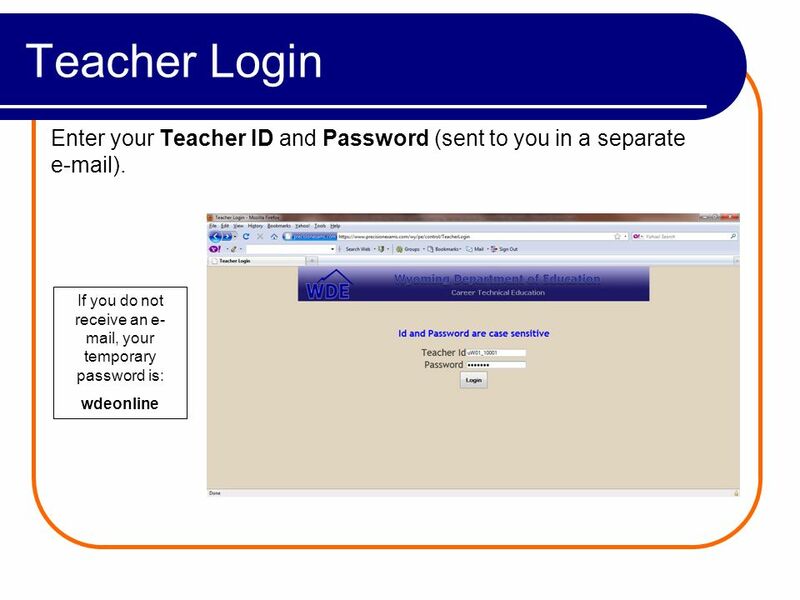 The FOCUS Parent Portal Creating A Parent Portal Account For the protection of your child’s confidential information, we have created the following secure. So how do I register online?. LionsLink You will use LionsLink for web registration, , course schedule, Financial Aid information, Campus announcements. Nell Eckersley & Venu Thelakkat. The GED Compass is a website that contains: Information about the GED test in New York Information about the Official.